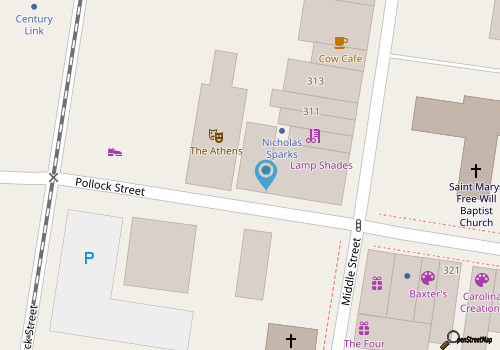 The theater's productions are staged within the historic and original Athens Theater on Pollock Street. Built in 1910, and opened to the public in 1911, the opulent downtown building was a gala theater that showcased silent movies, visiting theater troupes, Vaudeville companies, and local community productions. The name "Athens Theater" was extremely appropriate, as the structure was adorned with Greek revival architectural touches, from the gold gilded theatre boxes to the ornate woodwork and decadent chandeliers. The theater remained in operation for decades, renovating and adjusting along the way to accommodate "talkies" and later big budget productions, until the 1970s when the downtown area businesses was languishing, and new modern theaters could be found in the suburbs of New Bern and other surrounding Inner Banks communities. The New Bern Civic Theatre (NBCT), founded in 1968, was instrumental to its resurrection, and in 1980, the non-profit organization purchased the then-deserted building and embarked on a major restoration project. Just months later, the NBCT sponsored and staged its first live production at the "new" theater, a Neil Simon comedy called the "Star Spangled Girl," and the local company has been producing and performing acclaimed performances in the original Athens Theater ever since. Today, the NBCT is comprised of 12 board members, in addition to well over 500 active volunteers who work in every corner of the theater business, from set design and acting to box office ticket sales, to ensure that the town of New Bern and the surrounding Inner Banks regions enjoys a steady line-up of professional productions throughout the year. Performances are staged every month or so, and are a wide variety of dramas, comedies and musicals that showcase some of the Inner Banks' best talents. Recent productions include The Color Purple Musical, 12 Angry Men, and The Underpants, an independent comedy written by Carl Sternheim, and adapted by Steve Martin. Auditions for local residents and aspiring actors are announced online and tickets are available online as well or can be purchased by phone at 252 633-0567. Shows generally run for 2-3 weeks at the most, with regular evening performances and weekend matinee performances, so patrons interested in a particular production are advised to reserve their tickets early. Volunteers are also welcome in all aspects of the theater, from lighting to set design, and interested parties can call the NBCT for more information. Ticket prices vary, and generally range from $10 - $19, with special discounts given to students, active military, and patrons who purchase their tickets in advance. With a regular schedule that churns out 8-12 productions annually, visitors of all seasons will find that anytime is a great time to go to the theater. This nearly 50 year institution is a highlight of the downtown New Bern scene, and presents an exceptional opportunity for vacationers and locals alike to enjoy one of the town's historical treasures as they sit back and take in an expertly staged, and thoroughly entertaining night at the theater.